This set was originally offered as part of the "Cynthia's Baby House" online class project. We have had many requests to make these rooms available for purchase separately. We are now offering all rooms separately. Because the wonderful wallcoverings were such an important part of the overall effect in these particular rooms, it will be included in these kits. The sewing room includes a wall unit filled with every quilter's dream... a fabric stash. 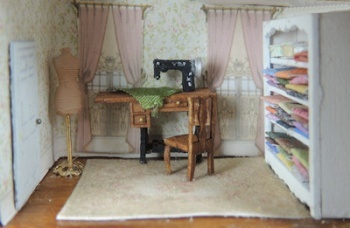 Also included is a darling treadle sewing machine and chair and a wonderful dressmakers mannequin. Wallpaper is also included. Please be aware that there is some variance in the room sizes of the baby houses. We have tried to scale the wallpaper so that it will work in all of the houses, but some variance as to exact window placement on back wall may occur.